On Friday tired yet excited riders crossed the line in Queensland, Otago, to earn their finishers’ medals in New Zealand’s The Pioneer, the third and final Legend event of the series in 2018. The Pioneer finishers had covered 424 km in six days of racing and ascended a formidable 15,124m during that time. Among them were the first three people to have completed all three of the Epic Series races in one calendar year – South Africa’s Tim Hammond, New Zealander Haley van Leeuwen and Chak Shing Cheng of Hong Kong. The eight-day Absa Cape Epic in the Western Cape in March is the pinnacle event of the Epic Series. 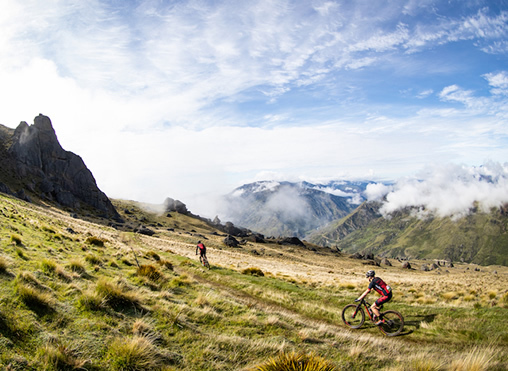 The five-stage Swiss Epic is next up in August and then The Pioneer over six days in November, with both Epic Series Qualifier Races giving riders the chance at a guaranteed entry to the South African event. “This is our first year in which we have hosted all three Epic Series races and are more than delighted by the way they have been received,” said Epic Series CEO Kevin Vermaak. “Congratulations to everybody who has managed to join the Epic Legend’s club and get a Legends medal – that’s an amazing achievement,” he said. A rider who finishes all three events earns the title of Epic Legend and receives a special Epic Legend medal – already one of the most sought after in the mountain bike stage racing. Hammond finished second at The Pioneer with fellow South African partner Alan Gordon (Team SPOT Africa/Insect Science) after he had notched up a 19th place finish in the Absa Cape Epic, riding with Arno du Toit. Hammond and Gordon finished 20th in the Swiss Epic. The Epic Series is a global portfolio of best-in-class mountain bike stage races. Epic Series Qualifier Races offer riders the chance to guarantee their slot in the Absa Cape Epic, the most prestigious mountain bike stage race in the world. Category winners in the Epic Series races are among those who get a guaranteed entry into the Absa Cape Epic, an event that traditionally sells out in seconds. The Pioneer winners Michael Vink and partner Tim Rush (ONYA Bike), both New Zealanders, have therefore qualified for the Untamed African MTB race. The women’s event was won by another Kiwi pairing, with Kate McIlroy and Amy Hollamby (Wellington Airport) winning by 20 minutes from Aussies Briony Mattocks & Brodie Chapman (Shimano). The event began with a Prologue on the snow-covered Coronet Peak in the Southern Alps before moving on to Central Otago for four stages and then to Queenstown and the finish on Friday. Vink and Rush generally dominated the men’s open event, leading from the Prologue. Their finish time of 20 hours 28 minutes and 25 seconds was more than an hour quicker than their nearest competitors. “What a week, it has been tough and character building, but we have learned so much and have improved throughout the week … and that is what we wanted,” said Vink. The Pioneer takes place in the southeastern region on New Zealand's South Island. The terrain includes snow-capped mountains, glacial lakes and a peninsula renowned for its sandy beaches. Queenstown, where the race finished, is a mecca for adventure sports enthusiasts.